Details Dewaxed Orange Shellac is produced from carefully selected raw materials by the solvent extraction system. With the solvent process wax and impurities are removed by dissolving the seedlac in a solvent, usually, chilled industrial alcohol. The solution is then filtered through fine cloth and the alcohol is recovered by boiling the solution. The dissolved shellac is then stretched to the required thickness on a roller. The product obtained is called dewaxed shellac. Decolorized grades of dewaxed shellac are further processed using activated carbon as a decolorizing agent. 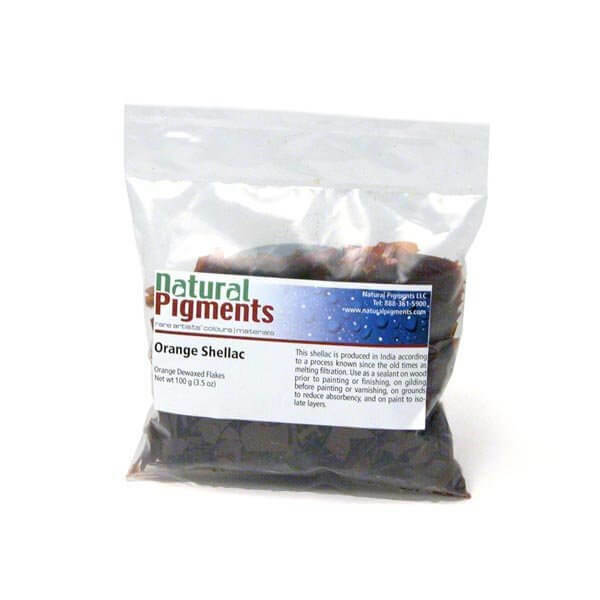 Orange shellac is the most popular shellac used in antique restoration and in reproductions of antiques. May also be used as a sealer coat over dark woods to seal in oils and natural resins. Orange shellac is also used to seal in wood knots. Orange shellac gives a warm tint. Dewaxed orange makes orange brown varnish. It's easier to build coats by brushing without streaking from dewaxed dark or garnet grades. Shellac is an excellent quick-drying finish. The flake form allows fresh quality shellac to be prepared and avoids waste. Use shellac as a sealant on wood after cleaning and prior to painting or finishing, on gilding before painting or varnishing, on grounds to reduce its absorbency, and on paint to isolate layers. The source of shellac from lac has been known since earliest recorded times. Atharva Veda, estimated to be several thousand years old, clearly states that both lac as well as lac dye served as medicine. It was used in China as medicine as well, long before it was used in art. The original cultivation of lac for resin was for the dye that gives the resin its characteristic color. The use of the lac dye can be traced back to 250 C.E. when it was mentioned by Claudius Aelianus, a Roman writer on natural history. The use of shellac as a protective coating appears as early as 1590 in a work by an English writer who was sent to India to observe the country and its people. Shellac is an animal product secreted by the Coccus lacca, a scale insect that feeds on certain trees in India and southern Asia. Soon after the scale insect is hatched, it leaves its birthplace and begins to wander about, looking for a likely place to settle down. It finds this place upon a stem or a leaf or on the outside of a fruit. It inserts its sharp little beak in the plant tissue and then settles down for a lifetime of nourishment at this spot. After feeding, the insect produces a gummy substance through its pores. It is soon covered by its secretion that in certain species looks like wax, in others like cotton, in still others like powder. The growing insect sheds one skin after another; these skins form a rounded scale, held in place by the secreted substance, which hardens into a protective covering called lac. This lac is collected and then it is crushed, washed and dried. After further treatment, it is skillfully drawn into thin sheets of finished shellac. The level of refinement, the timing of harvest, and source of the lac, determine the color and specifications that makes the various grades of shellac. Denatured alcohol can be substituted for methyl alcohol (denatured alcohol is ethyl alcohol with a small amount of methyl alcohol to prevent it from being ingested), but shellac dissolves better in methyl alcohol. Combine the ingredients in a dark plastic or glass container with a tightly fitting lid. Soak the shellac flakes in about half of the total alcohol to be used for 24 hours or longer (cool room temperatures slow the process). If you are using button shellac pulverize it to hasten dissolving. Stir occasionally and when dissolved add the balance of the alcohol. After the shellac is fully dissolved, it should be strained through a fine mesh cheese cloth to remove any impurities. Shellac is made from the lac bug and a few bits of bug carcass are often left particularly in Seed Lac. Store in a cool and dark place. Before the liquid shellac is used, it should be shaken or stirred thoroughly and allowed to stand for a few hours. Thinned with ten times its volume of alcohol, this solution serves well as a fixative. When applying as an undercoat prior to other paint or finishes use dewaxed shellac. Dip a natural bristle brush about half way into the shellac and gently remove excess shellac against the side of the container; this gives a reasonably filled brush for full strokes without incorporating air in the shellac. Apply the shellac in long strokes. Shellac should be sanded between coats. Allow each coat to dry thoroughly. If the shellac is dry, sanding will produce a fine powder on the surface. If the shellac is not dry it will be somewhat tacky to sand and the paper will clog. After sanding, wipe the surface thoroughly with a tack cloth and recoat. Depending upon temperature and humidity conditions, allow from two to four hours drying for each coat. Test all mixed shellac for drying if several months old. If the surface stays tacky after 8 hours and does not sand freely without gumming, the shellac is old and will not dry and must be discarded. Shellac is not considered to be toxic, but care should be used in handling the ground product to avoid inhaling the dust.